In this era of ‘disruption’, sometimes it’s important to pick people who work against the grain and develop an output that is not seen in the world. Whilst many of us were against this leadership style of Gaddafi, given the global economic fallout and that stock markets have been reeling after the proposed US trade tax on Chinese imports announced by Trump, sometimes we might ask how did Libya have a social welfare system which was better than any other country at that time or even many today. I remember being in the annual ‘Leadership in Development’ program at Harvard around six years ago when Gaddafi was captured and subsequently executed. We debated the thinking of this leader and shared the facts that we unearthed. Apparently electricity was free for all its citizens. There was no interest on loans and all its citizens were at a 0% interest by law. Home was considered a human right in Libya at that time. All newlyweds in Libya received 60,000 Dinars ($ 50,000) from the Government to buy their first apartment. Education and medical treatment were free in Libya. Before Gaddafi, only 25% of Libyans were literate. By 2010 it was up to 83%. If Libyans took up farming as a career, they received farmland, a farmhouse, equipment, seeds and livestock to kick-start their farms – all for free. At that time if a Libyan bought a car, the Government subsidised 50% of the price. The price of petrol in Libya at that time was $ 0. 14 per litre (Rs. 22). Libya had no external debt at that time and its reserves amounted to $ 150 billion – now of course it is frozen globally. If a Libyan was unable to get employment after graduation, the state would pay the average salary of the profession as if he or she was employed until employment was found. A mother who gave birth to a child under the Gaddafi regime received $ 5,000 as a child benefit upfront whilst during that time 40 loaves of bread in Libya cost $ 0.15. Gaddafi had carried out the world’s largest irrigation project, known as the Man Made River Project, to make water readily available throughout this desert country. Be that as it may, let me pick up the key lessons for business from the man who the world loved to hate – Muammar Gaddafi. 1) Revolutionary decisions: When he was just 27 years he led the coup that overthrew the monarchy in Libya. He then went on to ban gambling and alcohol and declare Islamic socialism which created a new ethos of leadership and governance in Libya, which were revolutionary decisions he made that made him a very strong brand. Gaddafi lesson 1: To make a brand stand out in the marketplace, it’s important to create a revolution in the marketplace just like what Apple did with its iPad, which broke all records even though consumers were struggling to make ends meet in the US and EU. In Sri Lanka today PickMe is an entity which has revolutionised the mobility market. The other day one of its owners said they were changing the system for Sri Lankans “not to own a car” but use PickMe for even systemic lifestyles like going to work and back daily or picking up children after school. Let’s see if this becomes a reality. 2) Be contemporary: Gaddafi was known for his decorative military uniforms and affluent lifestyle which includes living in luxury tents rather than at five star hotels during his visits to other countries. He carved out a niche globally for female bodyguards whom he surrounded himself with, which made him look modern and forward-thinking. Gaddafi lesson 2: Sometimes we wonder how a localised brand like Chandralepa keeps itself trendy given that the woman of today is going through a radical change in the clothes she wears, the music she listens to and the interests she maintains. The trick we see is that Chadralepa keeps changing their offerings to the woman of today so that she feels pampered and interested in the brand. A continuous change in high-quality communication - TV advertising and social media. 3) Aim for milestones: Apart from the high-quality oil that Libya sold to the world, the country was known for the supply of weapons to the global market, especially when the five-tonne ship was intercepted by the British authorities in 1973. Then again another ship carrying 120 tonnes of weapons and ammunition was stopped in 1987 but by that time Gaddafi was said to have been a billionaire. Gaddafi lesson 3: When it comes to a brand, this same objective holds ground. We have to get the scoreboard ticking to cross a milestone mark. In the recent past Maliban biscuits is a classic example in Sri Lanka of developing new products increasing distribution with a strong information system that has made the organisation triple in the top-line. The only difference is that Maliban does ethical business whilst being ruthlessly aggressive in the marketplace. 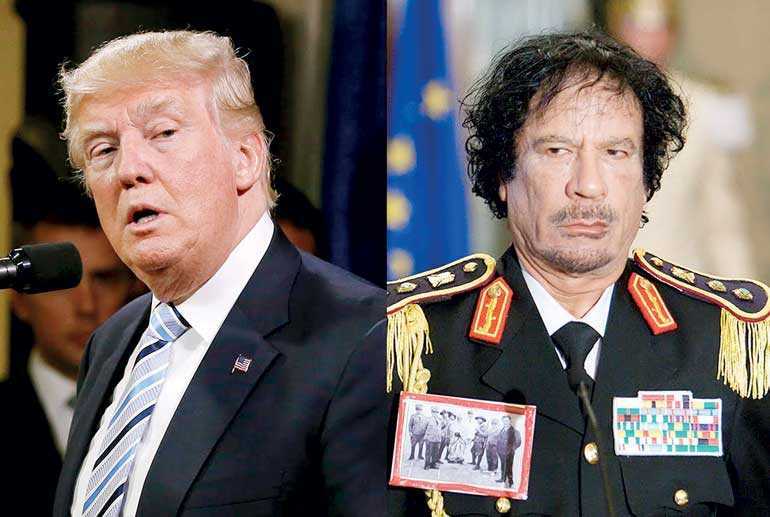 4) Be erratic and practice disruption: President Ronald Regan once branded Colonel Muammar Gaddafi a “mad dog” due to his erratic behaviour and outlandish antics, which included his self-styled leadership of a ‘Brother Leader’. In 1984, a diplomat at the Libyan Embassy in London shot a demonstrator outside, which led to the killing of policewoman Tnvonne Fletcher. Gaddafi lesson 4: In Sri Lanka I see this in the brand marketing practices of the radio and TV industry. Its Gaddafi-style cutthroat competition is coupled with outlandish antics that exist at its best, be it above or below the line. One company that stands out from the crowd is Hiru TV and Radio. The brands are so market driven that they won 5 Peoples Awards for their disruptive reporting of news. Was the company going against the industry grain in the product delivery? Yes it was and it did capture the hearts of Sri Lankans which is what is important. 5) Be different: To celebrate Gaddafi’s 30th anniversary of the revolution he showcased to the world a car which was designed by him. One government official classified the vehicle as the safest car in the world due to the specific features it contained. Gaddafi lesson 5: Sometimes to get attention from the public you have to design in a totally different manner, just like what Gaddafi did. My pick is the Daily FT brand. It was the first newspaper to go entirely cream and the first business newspaper that clearly differentiates itself from other newspapers in content and design. Within just two years the brand was leveraging readers, which other newspapers have taken a decade to achieve, and a sought-after must-read among the movers and shakers of Sri Lanka. So I guess Gaddafi style marketing sure helps in today’s world. 6) Hit man: There were eight recorded attempts of unsuccessful assassination operations to eliminate the Libyan leader. In 1993, intelligence reported that almost 2,000 soldiers from the Warfalla tribe were plotting to kill Gaddafi. Gaddafi lesson 6: When I look back at the strategies adopted by the brand Ninja mosquito coil with the trusted brand Mortein, it’s similar to the eight assassination attempts made on the Libyan dictator, starting with the launch of the first 10-hour mosquito coil to the cutting-edge dealer incentives that have made this brand a power brand today, close on the heels of Mortein. The essence is that in today’s world the hit man behaviour sometimes works. 7) White glove: After the Lockerbie bombing, Gaddafi started wearing a white glove to avoid coming into contact with the “blood-stained hands” of fellow Arab leaders at the conference in June 1988. Then he went on to cover himself with a sheet when Jordan’s King Hussein was addressing the gathering. Gaddafi lesson 7: The white glove to me was more of a mnemonic that made Brand Gaddafi stand out just like the famous glove of Michael Jackson. I still remember the days when I managed the power brand Dettol. One diktat that I got from the global office was that ‘Dettol Green’ had to be all over a piece of communication and that the cloud break (when a drop of Dettol was dropped into water) is a non-negotiable visual that has to be there. I guess the challenge is to decide what that glove was going to showcase on a brand. For the brand Dulux it is the dog whilst for Nike it’s the swoosh. 8) Philosophy: An independent political analyst who has interviewed the Libyan leader many times describes Gaddafi as a philosophical personality with a reflective temperament. He once offered to stop the influx of Africans into various European countries so that Europe could be ‘white and civilised’. Gaddafi lesson 8: Any brand/company must have its philosophical side to business. I yet remember the famous announcement by Unilever’s Senior Vice President Marketing Marc Mathieu who said that in the next 10 years the business ethos was ‘More Magic and Less Logic’ and the company is experiencing some of the most outstanding brand results. It is a clear indication of the entrepreneurial and disruptive attitude to business that is required in today’s world. The world needs such new theories and new business models. All must adjust. From the news reports coming on the sixth commemoration of Gaddafi, one of the noteworthy projects that Colonel Muammar Gaddafi has done for the people was the project for water security which will hold the people of the country in good stead even though the country sits on a desert. However, the issue was that the negatives outweighed the positives of the man. This made the people and world revolt against him. Maybe with some strong marketing on the positives and some checks and balances, history may have been written differently. But to me these are the eight pick-ups for the new world. (The author is an award-winning marketer, business personality and internationally sought-after speaker. He is the Country Director for a global multinational. The thoughts expressed are strictly personal in nature).